“I need your help!” John Ogle, vice president for development at the Luis Palau Association has had a longtime relationship with McConkey-Johnston, dating back to the mid 1980s and spanning three different ministry organizations. 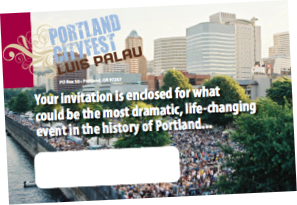 When he contacted M/J in the Fall of 2007 LPA was in the early stages of planning for Portland CityFest -- a massive “festival evangelism” outreach in the Pacific Northwest that was expected to draw more than 150,000 people to Portland’s Waterfront Park for two days of Christian music, family fun and powerful Gospel messages by evangelist Luis Palau. Larry Johnston and Jeff McLinden from M/J became members of the CityFest team, working with John, Festival department head Doug Terpening, project manager Chris MacFarland and his crew. M/J helped shape the communications planning and execution in the months preceding the launch of CityFest, including the development of e-mail and mail communications designed to enlist involvement and support of Festival “Advocates” -- the volunteers, donors and friends who signed on to help in the months leading up to the event. M/J was also responsible for a sequential series of acquisition mailings to generate interest and support for the Festival. 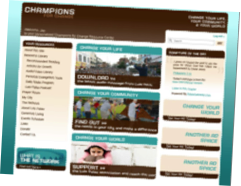 Finally, M/J worked with LPA development communications manager Jacob Bailey to create a post-Festival follow-up and conversion strategy called “Champions for Change” that included sequenced communications to Festival-acquired names and donors and a unique website designed to engage and convert these prospects over an extended period of time. Portland CityFest drew 185,000 people to the Portland downtown for the two-day celebration of service to the community and Luis’s powerful preaching. Post-festival activities are still working to engage long-term support for LPA activities and outreaches across the globe.